Are you searching for one of the most intimate honeymoon destinations in Mississippi? Here at Fairview Inn, our boutique hotel is tucked away in the heart of downtown Jackson, MS and offers luxurious places to stay on your getaway. You can also enjoy the peaceful nature of our grounds, our deluxe amenities, and easy access to our modern city. Whether you take a taxi to explore our Southern metropolis or delight in our on-site locations, you’re sure to feel closer with your beloved! There are many honeymoon destinations in Mississippi, but there is none quite like Fairview Inn. By requesting a copy of our complimentary Vacation Guide, you’ll have the opportunity to browse an excellent survey our charming accommodations, review our wedding packages, and learn more about our stunning property. Our carefully compiled travel planner provides you with our top choices for things to do, places to see, and events to attend! Whether you tie the knot at Fairview Inn, another venue in Jackson, or elsewhere, our boutique hotel remains one of the top honeymoon destinations in Mississippi. Discover what our property has to offer as well as how to spend your time in downtown Jackson! We invite you to browse our 18 charming guest rooms and suites and reserve the ideal escape for your first few days a married couple. Each of our intimate hideaways is individually appointed with the finest antiques, an abundance of natural light, and indulgent bathroom amenities. As you search, consider booking our Roman Suite! This inviting guest room boasts elegant furnishings, a marble fireplace, and comfortable seating area. 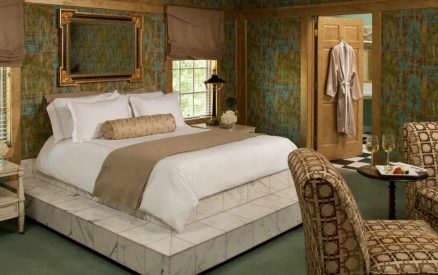 Whether you choose to curl up on the raised queen bed with marble steps or in the spa-oasis bathroom, you’re sure to feel closer with your newlywed on your honeymoon. When you wake each morning, join our table for a traditional Southern breakfast before your daily adventures! Do you wish to enhance your time even more? We offer an indulgent Honeymoon package. This enticing extra includes a dozen, hand-cut roses, a bottle of excellent champagne, chocolate-covered strawberries, and aromatherapy bath salts. For a small fee, add a gift certificate to the renowned 1908 Provisions, or book an appointment at our in-house Nomispa, one of the best spas in Jackson. With an assortment of romantic treats and intimate places to stay, why wait any longer to plan your vacation? We can’t wait to be your honeymoon destination in Mississippi this year! If you wish to spend your day relaxing on our charming property, treat yourself to the finest establishments in Jackson. Make a reservation at 1908 Provisions for a remarkable meal. Each of our signature Southern dishes features farm-fresh ingredients, locally sourced produce from the farmers market, and seasonal delicacies. Surround yourself in the literature of the 20th century at the Library Lounge. This swanky Jackson nightlife hangout offers an array of comfortable seating in an inviting atmosphere. Whether you order a glass of exquisite wine, a bottle of craft beer from house selection, or an artfully prepared cocktail, enjoy the upscale yet casual ambiance of this cozy lounge. Leave your cell phone in your room to reconnect with yourself and your significant other at the rejuvenating Nomispa. This luxurious oasis offers top-notch services, including soothing massages, invigorating facials, lavish body treatments, and wonderful nail services. Contact us today to book your next relaxation session! Jackson, MS, provides some of the best things to do for couples and offers many romantic getaways ideas to enhance your trip. Explore hand-in-hand while delighting in our top choices for intimate activities! If you wish to explore more of the Deep South, hop in your car, roll down the windows, and plan a day trip one of the charming towns outside of Jackson. Some of these wonderful locations include Greenwood, Natchez, and Ridgeland. Once you’ve completed your daily explorations, refresh, recharge, and relax at our boutique hotel. We are one of the top honeymoon destinations in Mississippi for our Southern hospitality and unique history. During your stay, walk through our peaceful halls and experience our intricate past. Fairview Inn was built in 1908 and captures the essence of the Antebellum South with Corinthian columns, Colonial-styled exterior, and other architectural elements. Enjoy strolling through our boutique hotel and around our property on your first days as newlyweds. We look forward to your arrival this year!